Cell phones are one of the greatest advancements in communication technology. In the past five years, cell phone usage has increased exponentially, even replacing landlines in many homes and businesses. According to an April 2015 report released by the Pew Research Center, 64% of Americans now own a smartphone, up from only 35% in April 2011. Cell phones have become so enmeshed in our daily lives, it can be easy to forget that cell phone etiquette still matters–especially in the workplace. The convenience and ease of cell phone communication can sometimes overwhelm the importance of face to face interactions, especially in the workplace. Remember that calls and texts are not always appropriate, especially during meetings and workplace conversations. Business Insider even warns against placing your cellphone on the table during a meeting, because you may appear distracted or disengaged. It may sound obvious, but it can become habit to answer your cell phone with an automatic, “Hello?” However, if you’re using your cellphone for business calls, remember to identify yourself when you answer a call. A simple, “This is Bob Smith speaking” or, “This is Sarah Smith” helps your caller feel at ease knowing who they are speaking to and establishes a professional, rather than informal tone to the call. Often when people speak on the phone, they assume a louder volume than they use in normal conversation, which can be disruptive or distracting to others, especially in an office environment. Always assume a normal, pleasant conversational tone and be aware of others around you. 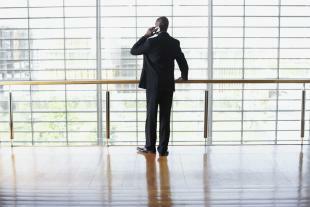 Consider taking your phone calls away from the desk and find an empty, quiet space if you need privacy during a call. If you’re speaking to a person on speakerphone, be sure to let him or her know. It not only prevents the other person from saying anything that might be inappropriate for other listeners to hear, but it also makes him or her feel more included if there are other people joining in the call. Voicemails are often unavoidable, but take care to keep them brief, especially when you are relaying detailed information. Consider sending specific information in a follow-up email, rather than lengthy voicemail. No one likes having to listen to a rambling voicemail, so pause before the voicemail beep to consider how you can communicate your message as succinctly as possible. If looking for more phone call etiquette suggestions to implement in your office, OpenSesame has a range of courses related to telephone skills, telephone courtesy, and proper cell phone use.